The newspaper, which celebrated its 150th birthday in 2018, allows itself to be a conduit for promotional propaganda: "fake news". This article will explain what happened, why, and look at the response from Trinity Mirror -- the owners of the Manchester Evening News. On 26 January 2016, the Manchester Evening News (MEN) published a story on its website. 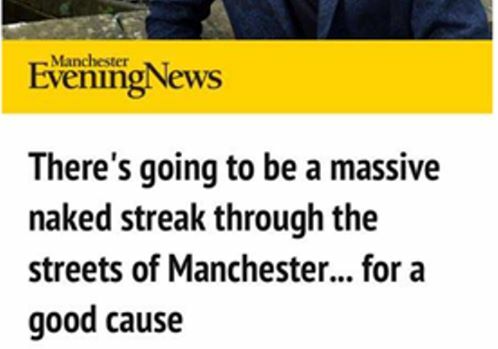 A "naked streak" would happen in Manchester's gay village this coming Easter, the MEN told its readers. The event would raise money for charity. "Buns are traditional at Easter," said one CEO. "Mine are smooth and hot but not crossed. Although my legs might be in this weather!" According to the MEN a (gay) city councillor said "I always like a sausage at our world-beating Christmas market. But I'm not sure residents are ready to see mine." In reality there was no naked streak and the quotes were fiction. The article came from a press release which we had written and sent to the Manchester Evening News about two hours earlier. Contrary to claims from Trinity Mirror, there was no "malicious" intent behind it. It had a journalist purpose. It was very much in the public interest that the MEN's lack of fact checking should be highlighted. Particularly as "fake news" is a concern currently. Our campaigners were tired of seeing misinformation and massively over-inflated figures in the Manchester Evening News over a period of many years. It was clear that some of that came from promotional press releases from the likes of Manchester Pride. So Pride's inclusion in the story was fully deserved. It seemed that no proper journalist scrutiny was being applied. That facts and figures from people who had every reason to exaggerate weren't subjected to the most basic checks by journalists at the MEN. There was a time when sub-editors did this checking. They would ring around people mentioned in an article to double check facts and quotes. At around 18:30 on 26 January, the press release was sent from a free email account that had been created an hour earlier (manchesterpride@protonmail.com). We thought the MEN might notice the address, but no it didn't. 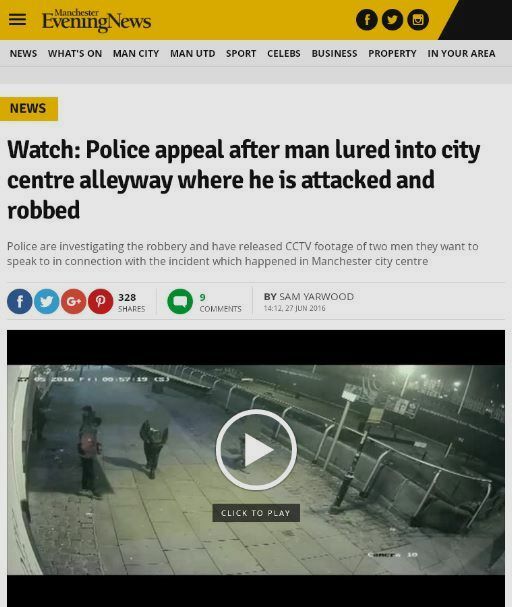 A screengrab that we made of Facebook the following day (27 Jan) at 16:38 shows that the story had appeared on manchestereveningnews.co.uk "20 hours ago." So we think at around 20:45. One of our campaigners made a complete screengrab of the mobile version at 14:48 on 27 Jan (shown at the top of this article). That shows an editorial time of 20:00. Trinity Mirror claims that the spoof was removed from the website within five minutes. We doubt that is the case. Certainly it was possible to screengrab an entire copy of the mobile version of the article more than 18 hours after it was published on the MEN website. Three weeks later Facebook still showed a link to the MEN website with a summary. This propagation via social media and search engines is one more reason why media outlets have a responsibility to check facts before dashing to publish. For a number of years our campaign group FactsMCR has been fighting to bring change to the annual LGBT Pride event in Manchester and the gay village, which now has the joint 15th most crime-ridden street in England and Wales. Our group is mainly LGBT people but not entirely. Some of our campaigners were involved in starting this event off more than 25 years ago, as a fundraiser for HIV/AIDS. However, since 2003 (when it was first run from the office of the tourist board "Marketing Manchester") it has become increasingly commercialised -- a profit-spinner for businesses. Whereas it used to be free to attend the weekend (also known as GayFest, Mardi Gras, and AbFab over the years), since 2003 the entire gay village area has been fenced off with a costly entry ticket. Yet the fundraising has fallen by the wayside somewhat, while costs and prices have risen. 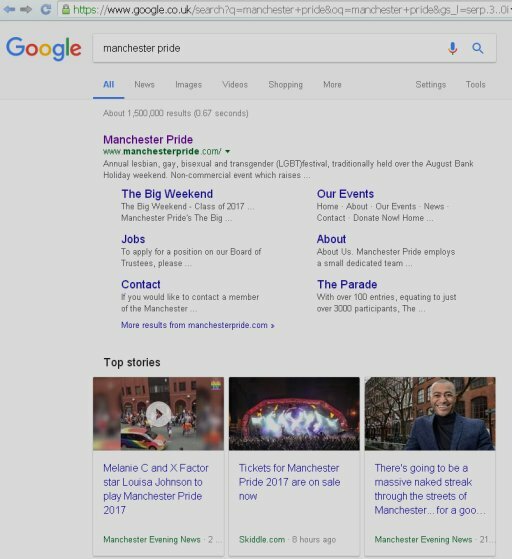 We have researched the history of gay events in Manchester because we were alarmed by the wrong information that was publicised by Manchester Pride and picked up by the media. Attendance figures for the Saturday parade published by the Evening News have ranged from 600,000 in 1999 (when the event was known as Mardi Gras) to 50,000, 200,000 and 385,000 in other years. It's a short parade mainly on narrow streets and it would be difficult to fit in even 50,000 people. We have measured the route and we think about 25,000 is a realistic figure. More recently the Manchester Evening News has kept the public in the dark about a highly successful challenge made by us regarding the streets being closed to the public unlawfully. Despite a ruling by the Local Government Ombudsman about that, in April 2015, the MEN misled readers later that year, as you will see. In 2013 we were tipped off by a business that Manchester Pride and Manchester City Council had been closing the public streets to pedestrians unlawfully since 2003. Assisted by private security and Greater Manchester Police (who are paid about £50,000 each year by Pride). Since 2003 the whole of the gay village area had been fenced off for the extended weekend of Pride. A wristband had to be purchased to enter and residents who lived inside the fences were forced to carry a pass. Incredibly, in a letter in 2011, Manchester Pride claimed to have the power to "grant" or refuse entry to homes. Possibly only a gay organisation could have got away with this, under cover of political correctness and being a "charity." Capitalising on the fear people feel in case they are labelled anti-gay. And note what one of the tactics has been following our press release. Yes it has even been hinted that we are somehow homophobic. This is why it is so important that we LGBT people speak out ourselves. Before the Pride event at the end of August 2014, we contacted the Department For Transport (DFT). In a letter to us the DFT confirmed that it was unlawful to block access to premises (businesses and homes). Indeed some businesses within the fences were quite happy to allow entry to their premises without a paid wristband if only people could reach them. 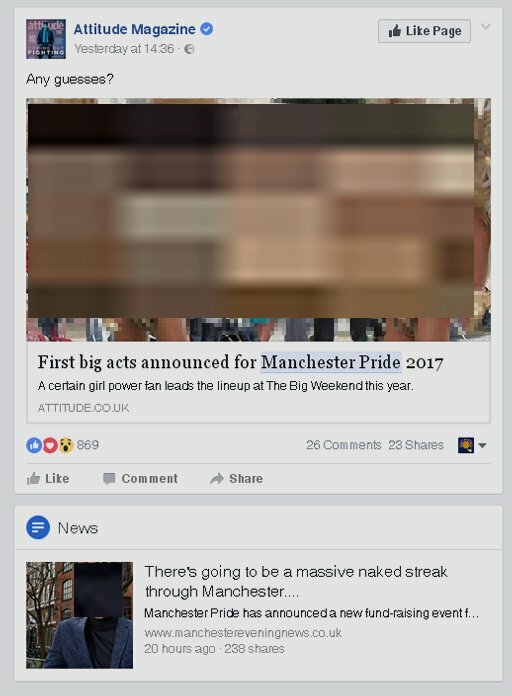 On Facebook a business person who has close links to Manchester Pride called for a boycott of other businesses which hadn't paid Pride money. Those law-abiding businesses were seeing customers, who didn't buy a wristband, illegally denied access to their premises via public streets and now on top of that they faced a boycott by those who did buy a band. But this "pink racketeering" wasn't reported by the Manchester Evening News. At 17:00 on the Saturday of the 2014 Manchester Pride weekend our (peaceful) campaigners asked to be allowed in. They were blocked by Pride's paid security. Officers of Greater Manchester Police stood, watched and even laughed. You can see videos of this on our page here. This at a "pride" event. Gay pride grew out of the Stonewall Riots in New York in 1969. What happened wasn't reported by the MEN. The following April in a ruling, the Local Government Ombudsman confirmed (PDF) what the DFT had written. Greater Manchester Police then made it clear that the public couldn't be blocked and on the whole they weren't in 2015 and 2016. However there was a news blackout about our victory and the change. Both in the LGBT media and the Manchester Evening News, which claims to support the gay community. And that continues to the present day. 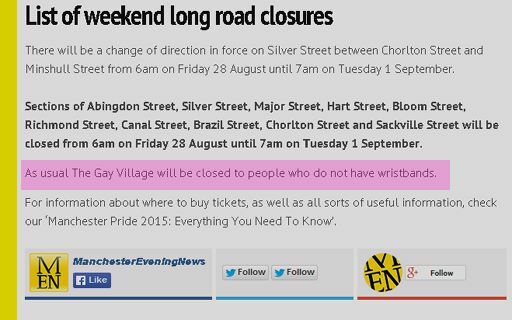 Just before Manchester Pride 2015 the Manchester Evening News told readers that a wristband would be required to enter the gay village "as usual." A complete lie. It seems that supporting business profits and slavish support for a corporate gay "charity" were more important than telling the public the truth. In 2016 as far as we can see the Manchester Evening News continued to stay silent about the changed situation. In 2016 Manchester Pride received almost £60,000 from the Heritage Lottery Fund for an LGBT history project. Over the last decade some £250,000 of Lottery cash has been spent on LGBT history projects in Manchester. In an interview with Mark Fletcher the CEO of Manchester Pride on 2 May 2016, the Manchester Evening News wrote that 2015 had been the 25th anniversary of LGBT celebrations in the city. This was untrue. Fletcher claims he wasn't quoted fully so the context was missing. However Manchester Pride itself has a long history of putting out misinformation about the history. 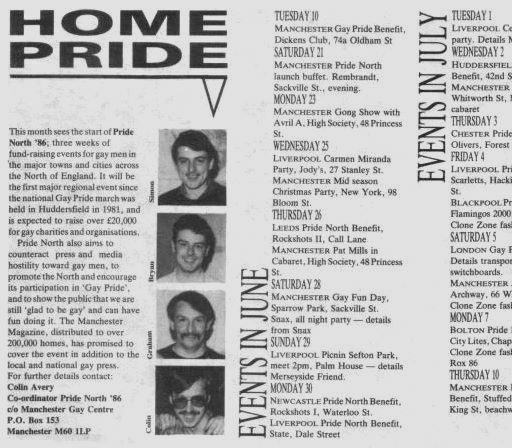 There was a pride event in Manchester in 1986 and other "celebrations" prior to 1990. The information is available in the Central Library for any journalist who can be bothered to look. Manchester "Gay Pub and Club Olympics on August Bank Holiday 1985. Reported in the September 1985 issue of Mancunian Gay magazine which is available at Manchester Central Library. As campaigners we're trying to bring about change: more inclusion, a less commercialised event and more money raised for good causes and we carry out research. By 2011 there hadn't been a public meeting about Manchester Pride for more than a decade. We arranged one in summer 2011. We care about transparency, honesty and accuracy. But, not only have we found ourselves up against the corporate Manchester Pride event, controlled by the tourist board. We have faced inaccurate and falsely inflated information in the mainstream media -- particularly Pride's "media partners" the Manchester Evening News. The 149-year history of the once-proud MEN adds weight. Now we're told that it's blogs and independent media which tend to be "fake news." While mainstream newspapers are gatekeepers of the truth. Members of Parliament are about to debate this. Is this the precursor to censorship and the removal of ad funding from independent media and blogs? In its response Trinity Mirror claimed that the newspaper checks attendance figures with Greater Manchester Police amongst others. "With regards to the estimated attendance figures we get those direct from the organisers [Manchester Pride]. We do not keep any attendance figures. The best person for you to speak to would be the organisers themselves..."
So the MEN checking with the police is actually no check at all. Anyway, how would several independent sources come up with a ludicrous parade attendance figure of 600,000 in 1999, 385,000 in 2001, and within the space of five days in 2005 figures of 200,000 and 50,000? It doesn't make sense. Just to put that claimed 600,000 figure into context. That would be equivalent to more than one quarter of the entire population of the metropolitan county of Greater Manchester standing on the streets of the city centre (and only on the pavements, remember) watching the pride parade. We calculate that if you squeezed two people into every available square yard of pavement and road along the route (with no space for a parade) you would still have to stack people three high to fit in 600,000. You can calculate this for yourself by using a satelite image on Google Maps and measuring the roads along the route. These figures are still online on the Manchester Evening News website. Also see below. In its response, Trinity Mirror suggests that only one example of misinformation has been forthcoming. In fact we were in touch with an Assistant Editor at MEN Media in March 2011 when we discussed the published attendance figure of 100,000 for the Irish Festival parade and which we believe was a ten times exaggeration. The Assistant Editor told us in an email that the figure came from the organisers and that he saw no reason to question it. A journalist who sees no reason to question, when the sender has every reason to exaggerate the scale of their event. We were in touch again in 2015 regarding the statement that the gay village would be "closed as usual." Several emails which went unanswered and a phone call. We complained to the press regulator IPSO but it was not upheld. Trinity Mirror has suggested that our campaign is just one individual. But look at the videos at the gates of Pride in 2014 and you'll see a number of people. And the person they seem to be referring to wasn't there. We understand it has even been implied that the press release was sent by someone who is not LGBT and that there may be a homophobic motive. Untrue. It isn't clear where that suggestion originated from. But these are desperate tactics. Why shouldn't LGBT people criticise a corporate Pride event? It's insulting to imply that they will be happy for false facts and figures to be published by the press just because it over hypes a gay event. Trinity Mirror is always happy to dish it out in its "news", but claims malicious intent when it is exposed itself. This operation was in the public interest and a former member of the National Union of Journalists was involved. Is it, in fact, the MEN which has a case to answer? Why so eager to believe this silly story about the LGBT part of Manchester? The idea that gay CEOs of charities and a gay councillor would be ready to dash naked through the streets and make saucy remarks about sausages and easter "buns." Is that so different to the TV stereotypes of the 1970s? Do they ever think of refusing to present LGBT people to the public in this way? Hushing up legal rights, being uncritical of alcohol driven events when booze and related HIV infections are such a problem. Staying silent about rising charity costs and fundraising failure. Printing press release hype which helps to prevent positive change and possibly more money for needy good causes. These things don't make you a friend and "supporter" of the LGBT community. To many LGBT people it makes you the enemy. It doesn’t matter how old these articles are. They are still online as the links below show and thus continue to mislead. Newspapers are preserved by libraries as a "historical record" of events. Currently we’re led to believe that blogs and independent media are "fake news," while mainstream media is "the truth" and MPs are about to debate this. Small businesses pay for pitches at events. Tourists pay to visit cities and for tickets in advance. They’re entitled to know the true attendance, scale and history. Councils may give out grants based on perceived popularity; so an event which supposedly attracts "250,000" people may receive funding while a library closes. Other public funds are given for LGBT history projects which are then undermined by poor journalism. Campaigners struggle to bring change to events which are only the "best" and "biggest ever" thanks to the delusions of PR people and "churnalists." In this way, newspapers become part of the problem. A conduit for propaganda. The route of the Saturday Pride parade through the city centre is only about 2,500 yards long -- from Liverpool Road to Manchester Piccadilly. The route has varied very slightly over the years but the distance hasn't (we have measured it on a satellite image). People are restricted to the pavements only in most places. Many of the streets are quite narrow and any sensible analysis must conclude that fewer than 50,000 people can fit onto the streets along the route. No ticket is needed for the parade. The greatest number of tickets sold for the Weekend itself seems to have been 51,000 in 1998 when a ticket was only needed to get into bars and clubs. Even if you disagree with our analysis you can see that the attendance figure for the parade published by the Manchester Evening News (MEN) in articles over the years has varied from 600,000 (equivalent to one quarter of the entire population of Greater Manchester at the time) in an article in 2000, to 50,000 in an article in 2005. Most remain online today, misleading the public. "An estimated 600,000 people viewed the colourful procession last year." "On the Saturday 385,000 people turned out to watch the Parade." "More than 200,000 people watched the parade"
"One of the highlights of the 10-day event was the Key 103 Pride Parade through the streets of Manchester, watched by an estimated 50,000 people." The same event. Yet five days later the MEN states that only 50,000 watched the parade. In the article the MEN writes that this was the "biggest ever Manchester Pride Festival" and the "best ever." Yet the parade attendance seems to be down to one seventh of the 350,000 who watched in 2001 and one twelth of that 600,000 crowd back in 1999. "More than 100,000 people lined the streets for the annual St Patrick's Day parade." claims the MEN. "The event was the biggest ever staged in Manchester – and the biggest in Europe outside the Emerald Isle." Meanwhile, on planet earth, photographs of the parade show fairly empty streets on a route of just 1.5 miles. The true attendance was probably less than 10,000 people. The Department For Transport had written that nothing in Manchester City Council's Traffic Order could "at any time prevent access for pedestrians to any premises situated on or adjacent to the road." The MEN knew this and even published a photograph of the DFT letter in its article. Yet it still referred to campaigners walking in as a "mass trespass." The truth was turned on its head as it was unlawful (and possibly a criminal offence) to prevent them from walking in. Afterwards the MEN didn't report that the campaigners had been blocked unlawfully. "as usual The Gay Village will be closed to people who do not have wristbands." This was untrue and no doubt led to some members of the public buying tickets that weren’t needed. And perhaps residents accepting "passes" to get them to their own front door within the fenced area. A further year on and it appears there was still no coverage from the MEN enlighting the public to the changed situation regarding tickets and fences. For two years, Greater Manchester Police had insisted that the law must be respected and the public be able to access premises during Manchester Pride without buying a ticket. Letter to the FactsMCR campaign from Greater Manchester Police, 12 January 2016. In this article the MEN writes that Quentin Crisp was buried at Southern Cemetery in Manchester. This is untrue. Crisp was cremated in Manchester and his ashes were flown back to New York. This is mentioned on the DVD of An Englishman in New York and on Wikipedia. Just to be certain, we contacted Quentin Crisp's executor Phillip Ward in New York. He confirmed that Quentin Crisp is not buried in Manchester. He was cremated and his ashes were taken back to Mr Ward in New York by Crisp's "Author’s On Tour" travel partner Chip Snell. The Manchester Evening News claims that 2015 was the "25th anniversary of LGBT celebrations in the city." But this is untrue. 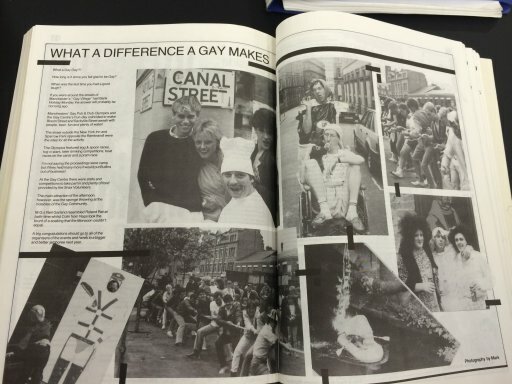 Magazines and flyers, many of which are available at Manchester Libraries, for any enquiring journalist to see, show that there were events in Manchester in August 1985 (Gay Pub and Club Olympics) and June 1986 (Pride North). There was the Section 28 March in 1988 and an event called Love Rights '89 in 1989 which was billed as a "celebration of Lesbian and Gay Sexuality." In the article, Mark Fletcher the CEO of Manchester Pride, is quoted: "twenty five years of LGBT events in the city goes to show what an open city we live in." In an email Mr Fletcher told us that his comments had been "edited and may be read out of context, my reference to the 25th anniversary of LGBT events in the City Centre was in relation to August BH events (based on the inauguration of the Village charity in 1991, as previously mentioned)." But somehow that didn't get published. Once again readers of the MEN were misled. At the LGBT Question Time event at Manchester Town Hall on 12 February 2017 a member of the audience stated that when he researched Manchester's LGBT history as a student he was surprised to find out about all the community campaigning in the 1980s. He'd never heard about it. And despite £250,000 of Heritage Lottery money being spent on a number of Manchester-based LGBT history projects over the last decade. In this article the Manchester Evening News refers to "fashion designer" Quentin Crisp. In what sense was Quentin Crisp one of Manchester's "most famous gay people"? He never lived in Manchester. Pride at 21 in 2011? But here's Pride North '86, co-ordinated from the Manchester Gay Centre. With a launch in The Rembrandt pub on 21 June 1986 and Gay Fun Day in Sackville Park on 28 June. "Manchester Pride raises record amount for charity in 2016," wrote the Manchester Evening News on 25 November 2016. 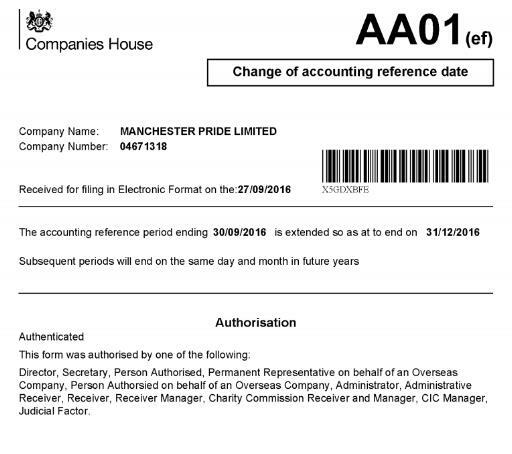 What the MEN didn't tell its readers was that Manchester Pride had changed its end of year accounting date from 30 September 2016 to 31 December 2016, giving it a 15 month accounting year in 2015/16. It isn't clear exactly what effect that may have had on the fundraising. But it means Manchester Pride will have had about an extra six to seven weeks of income before this "record amount" announcement. This article claims to be a request for witnesses to a crime. However it gives the location of the incident as being the almost unknown "Beaver Street." When the video clearly shows the perpetrators on Canal Street in the gay village (next to the New Union pub) where they might have been seen by many people. An appeal for witnesses to a crime is compromised. 15 May 2017: "Fighting 'fake news': Why you should trust The Manchester Evening News as the general election nears." 1 April 2018: Hilariously the Manchester Evening News is being held up by The Guardian as an example that exhibits "the vital bond of trust" that journalists need to win back. We beg to differ! Three years and counting since the ruling by the Local Government Ombudsman. 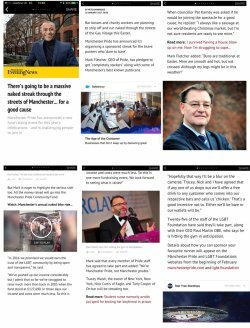 "Media partner" the MEN continues to stay silent about the public being defrauded by Manchester Pride, residents and businesses being bullied and Manchester City Council "exceeding its powers" with unlawful pavement closures for 11 years. Consumers are still being misled every August. However, more find out about this every day and the catalogue of mistakes and deceptions above from the MEN speaks for itself. We don't mind. These news outlets are digging their own graves with this stuff, which many readers question below the line in their own comment sections. 1 July 2018: The MEN writes that the incident happened outside AXM bar. But AXM ceased to exist 11 months earlier and the premises (which were once Hollywood Showbar) are currently called Club Bloom. In fact the closure was a "news" story for the MEN at the time. Rivetting stuff... In another fail, the MEN's photo shows the opposite end of Bloom Street at the side of the bus station, when in fact the incident happened yards from the Princess Street end. What a great help this must be in reaching witnesses.